How Does That Taste? : Jay Triano Is Hired : Raptors Basketball....It's Lacklusterrific! 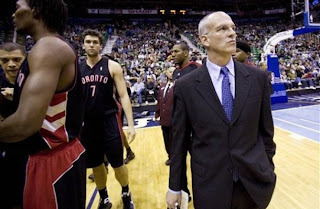 Jay Triano Is Hired : Raptors Basketball....It's Lacklusterrific! An Image That Will Be All too Familiar Next Season. Jay Triano calling a timeout with the Raptors way behind. The Toronto Raptors mailed in the entire 2008/2009 season. It was so bad that Canada Post should have replaced BMO as the chief sponsor. Their performance through the entire season defined the very essence of the word lackluster. After the firing Sam Mitchell in December, Jay Triano became the interim Postmaster General and managed to change nothing and guided the team to a 25-40 record. On May 11 the Raptors removed the interim label from Triano and he was officially named head coach. Bryan Colangelo has managed to parlay nepotism and high collared Italian shirts into a reputation as a basketball savant. His team in Phoenix was built on trading Stephon Marbury to the Knicks and signing Steve Nash. Winning a trade with the Knicks has the same degree of difficulty as beating Miss California in a game of pictionary. Heck the Italian Army has a better success rate. Colangelo has had some success and made some blunders. His biggest error was keeping Sam Mitchell. Instead of letting him go after 2 poor seasons, Colangelo decided to let Mitchell have one more year. The one year left on the contract which they would have had to pay if they let him go. Rather then pay 2 coaches, Mitchell was kept. While they are both well dressed dandies, they had fundamental differences with basketball philosophy. While Colangelo wanted to bring a European game to Toronto, Mitchell was born in the dirty south and best known as a player for being Kevin Garnett’s caddy in Minnesota. Somehow he blundered his way to Coach of the Year in 2007 and Colangelo was left with no choice but to keep Sam. A year and a half later, Mitchell was finally gone from the bench but still on the payroll. Jay Triano, who had been an assistant with the team since 2002, wasn’t the best choice but he was already here and came cheap. Generally the Canadian University players and coaches are not the place people look for NBA coaching talent. He was the obvious choice when the Vancouver Grizzlies were looking for a colour commentator and Director of Community Relations. He was already in Vancouver and he came cheap. When the Grizz went south, Triano, then National Team head coach was picked up by the Raptors mostly as a Marketing tool. Look Jay seems like a nice guy and has been a solid promoter of basketball in Canada. What irks is that if it wasn’t for the huge coach of the year contract still on the Raptors books another coach would have been hired. A 25-40 record and a seventh place finish in the Olympics doesn’t exactly inspire confidence. Neither does the fact that Triano was a popular pick amongst the players. The very same players who barely showed up this year until late in the season where they ruined the teams draft position by playing for their contracts.